Torches are lit as the festival begins. Image © Thaddeus Pope. All rights reserved. 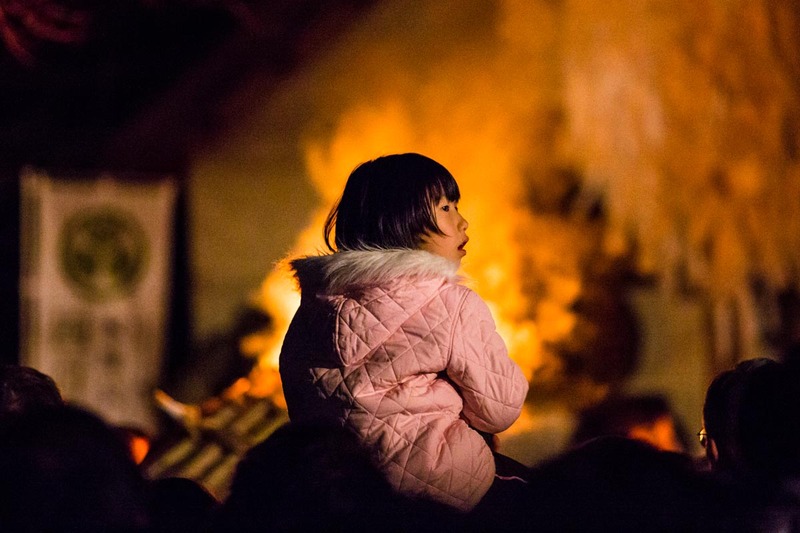 A young girl looks on as the torches are lit. Image © Thaddeus Pope. All rights reserved. 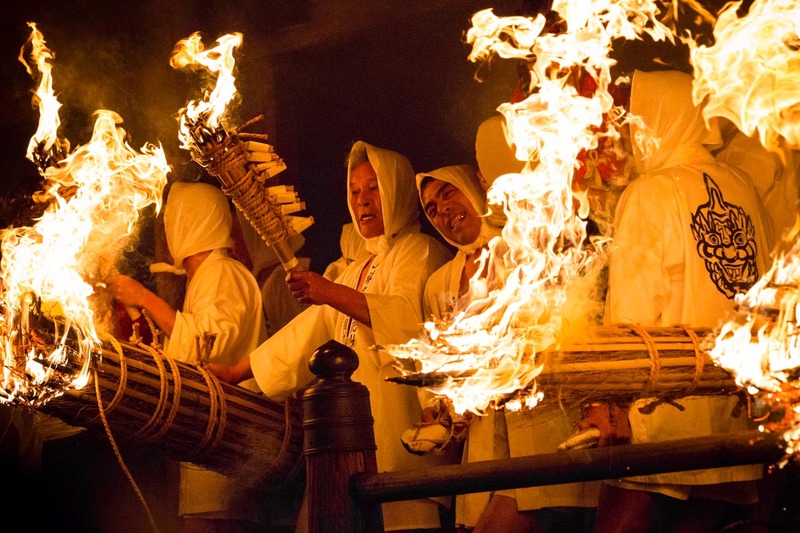 The younger participants carry the massive flaming torches around the perimeter of the temple with great enthusiasm at the beginning of the festival. Image © Thaddeus Pope. All rights reserved. 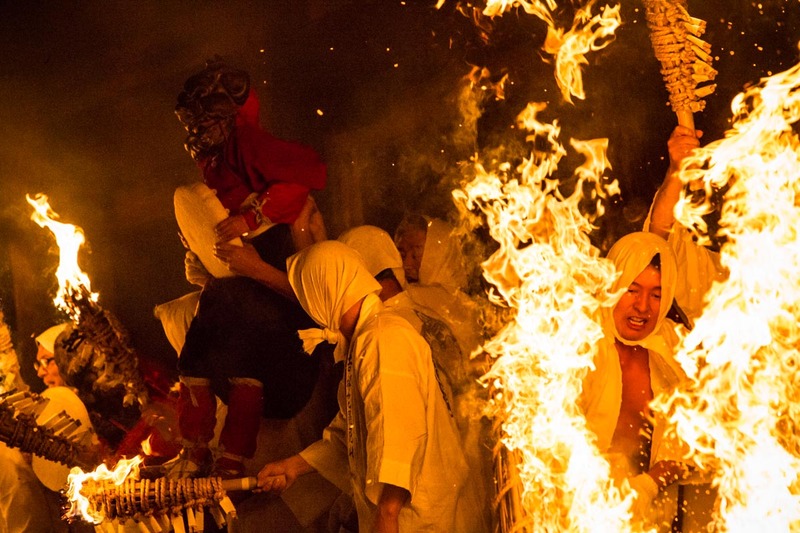 The drama and excitement of the festival begins in earnest as the men begin running around and through the ancient wooden temple carrying the massive flaming torches. Image © Thaddeus Pope. All rights reserved. 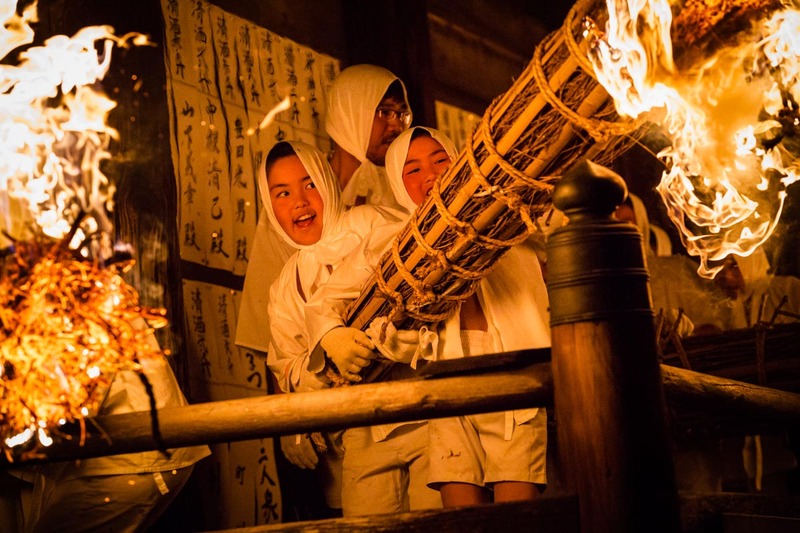 Dozens of camera flashes illuminate the scene as the young boy wearing the demon mask is lifted onto the old wooden railing surrounding the temple. The large rice cake he holds signifies peace and a good harvest in the coming year. Image © Thaddeus Pope. All rights reserved. 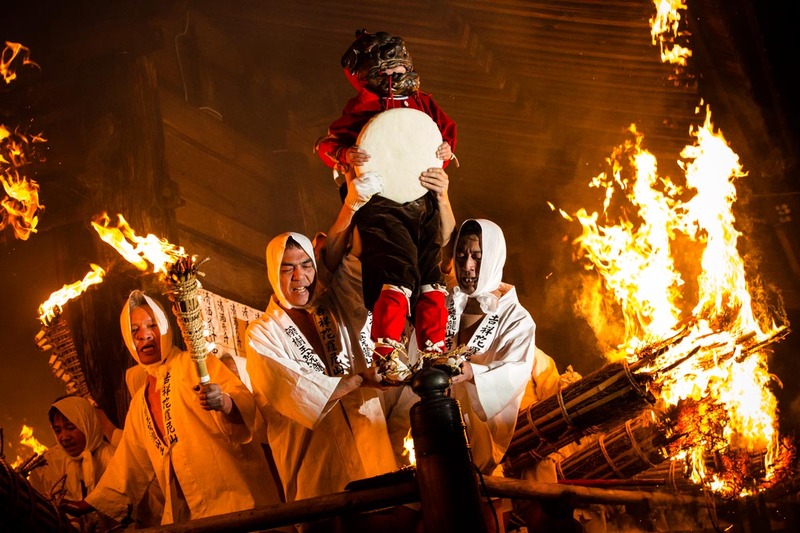 The audience erupts into applause as the men emerge from the temple carrying a young boy wearing a demon mask and holding a large rice cake (the rice cake is a symbol that promises a new year of peace and a good harvest). Image © Thaddeus Pope. All rights reserved. The torches are extinguished in large barrels of water as the festival draws to a close. Image © Thaddeus Pope. All rights reserved. 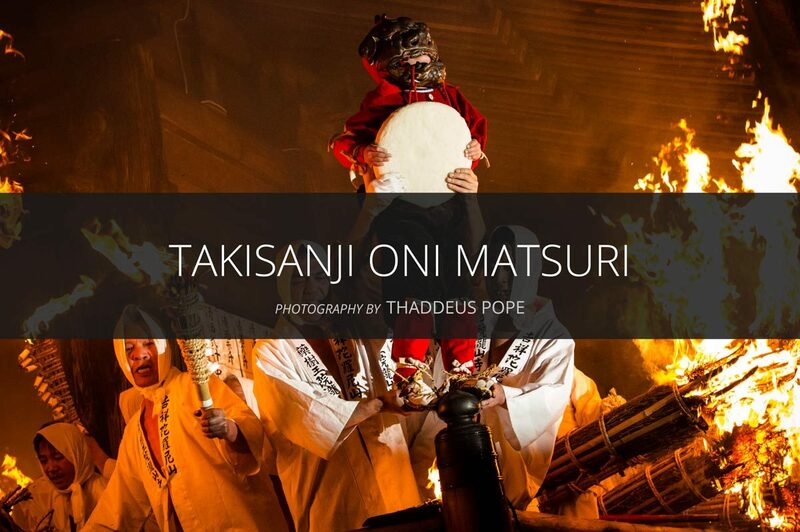 The Takisanji Oni Matsuri (Takisanji Ogre Festival) at Takasanji Temple in Aichi Prefecture takes place on the evening of the last day of shushoe (修正会) – an annual ritual to pray for peace and good harvest for the coming year, which lasts for seven days from January 1st in the old Japanese calendar. 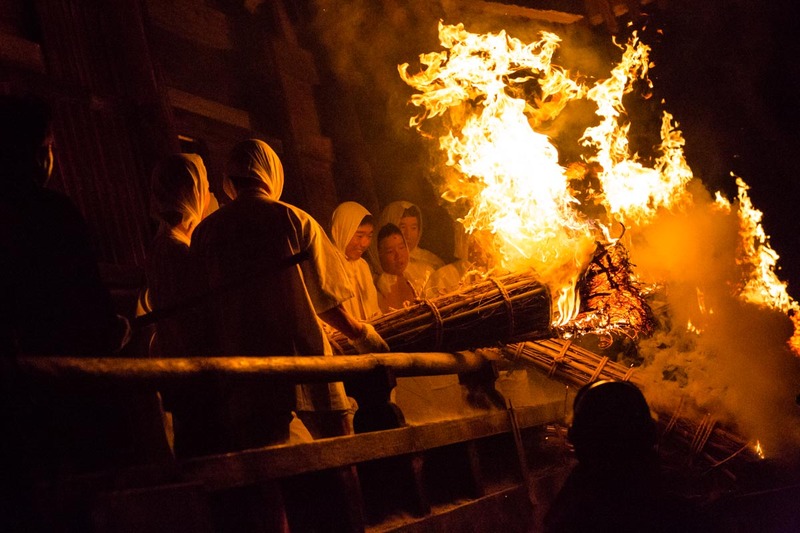 This unusual festival, which features a spectacular fire-based purification ceremony, is said to have begun during the rule of Minamoto no Yoritomo (1147–1199), founder and first Shogun of the Kamakura Shogunate of Japan. One central aspect of the festival involves bestowing blessings on males aged 12, 25 and 42 from the local community. Three of these males are chosen to participate in the purification ritual while wearing ceremonial ogre masks. A 42-year-old wears the mask of the Grandfather, a 25-year-old wears the mask of the Grandmother, and a 12-year-old wears the mask of the Grandchild. 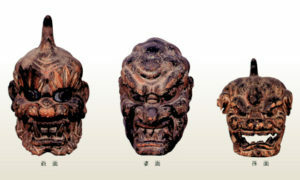 These unusual masks are believed to have been created by Unkei (1151–1223), the celebrated master woodcrafter from the Kamakura period. Despite their frightening appearance, the three masked ogres are entrusted with the responsibility of driving evil out from the temple. On close inspection, you will see that they hold peculiar objects in their hands, including axes and bells – these are used as weapons to chase away evil spirits. They also hold large rice cakes, which symbolise the promise of peace and a good harvest for the year to come. In accordance with tradition, the individuals assigned the role of the masked ogre must spend seven days isolated from the outside world before the festival to ensure that they have cleansed all evil and sin from their bodies. During this time they are banned from interacting with women and eating animals with four limbs. All their meals must be served by men. On the evening of the festival, following prayer rites and the traditional Japanese custom of mame maki (豆撒き), the three masked ogres and approximately 30 males (all born in a year sharing a sign of the Chinese zodiac with the festival year) parade around and through the ancient wooden temple. 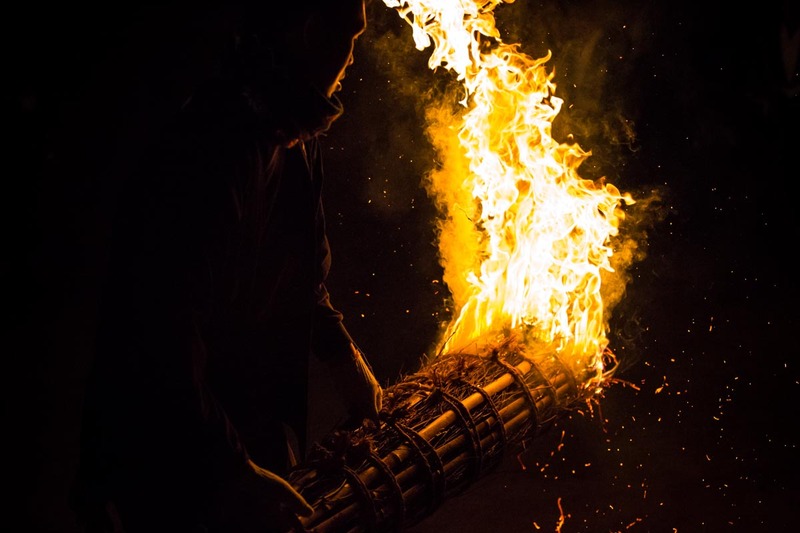 During this procession they carry huge flaming torches and make as much noise as possible by banging drums, bells and gongs, and blowing on horns made from large conch shells. Some people still bring the scattered crops home and use them as medicine when their children are sick. 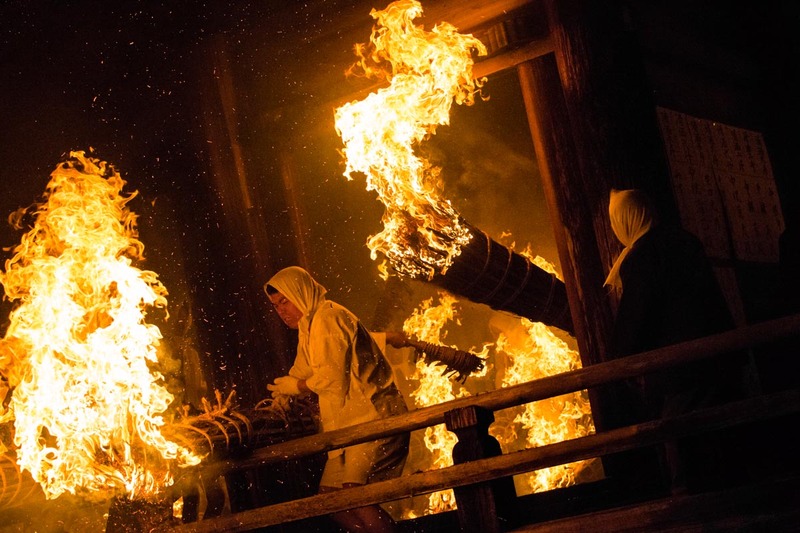 Based on the spectacular amount of fire that is carried through the building – a nationally registered cultural heritage site – during this winter festival, it’s hard to imagine how the wooden structure has survived for so many years, but it explains at least in part why after the performance has ended that audience members queue up to take pieces of the torches home as lucky charms. Special thanks to Takumi Saito-san for his translation services.